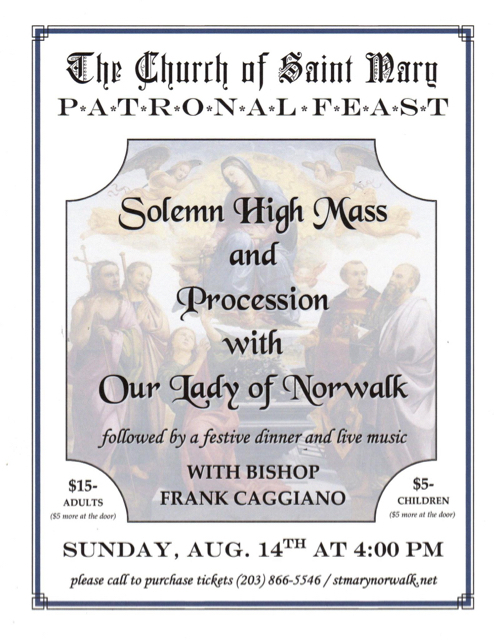 The Patronal Feast of St. Mary's Church in Norwalk, Connecticut, will be celebrated with more than the usual solemnity, pomp and fun this Sunday afternoon, as the Most Rev. Frank Caggiano, Bishop of Bridgeport, will take part in the day's events. A Solemn Mass in the Presence of a Greater Prelate will be celebrated at 4 p.m. Sunday, followed by a "Parish Festa" that brings the many ethnic groups of the parish together. The Schola Cantorum of St. Mary's will sing Mozart's Missa Brevis in D, with motets by Mozart, Palestrina and Victoria. 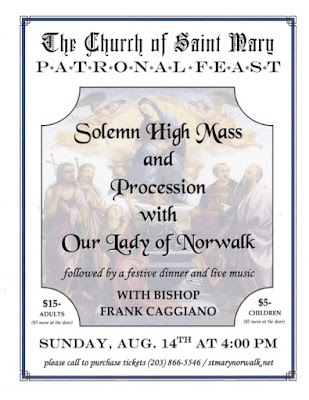 Following the Mass, Bishop Caggiano will bless an antique statue procured by the parish and put her under the title of Our Lady of Norwalk. The statue will then go into procession through the streets before taking residence in the church. The day ends with a parish dinner and entertainment with an Italian flavor, bringing together the 19 nationalities and ethnic groups that make up the downtown parish.